I love anything home made! I get immense satisfaction from making something from scratch. However, any ‘help’ I can get in the way of an appliance makes the experience much better. In December Dave and I got a Kitchen Aid Mixer for Christmas and for my birthday I got this Kitchen Aid Pasta Attachment. Everything from Kitchen Aid is easy to attach. It is a simple matter of removing the protective cover off the motor, inserting the drive and tightening the screw. Once that is done it is A for AWAY. All you have to do is make the pasta dough (recipe to follow). The dough is then put through the rollers with the motor at a speed you can cope with – not too fast however. This needs to be done several times on the thickest roller setting until the dough has developed its gluten properly and is nicely shaped and perfectly shiny. Once you have achieved this, put the dough the decreasing roller sizes until you get the thickness you desire – not too thin for ravioli and as thin as possible for spaghetti. I leave my spaghetti to dry on a stand before cooking it. The great thing about home made pasta is that you can make it any flavour / colour you desire, it takes only 3 minutes to cook in boiling, salted water, and it tastes superior to any shop bought product. you can do this by hand, or in a food processor or in the Kitchen Aid! Wow, great!! Where did you buy the squid ink? I wonder if I can buy squid ink sachets here?…. I adore making pasta and love the look of the ‘nero’ ones. Nicely done Tandy! What a great idea to add squid ink to the pasta. Nice twist! 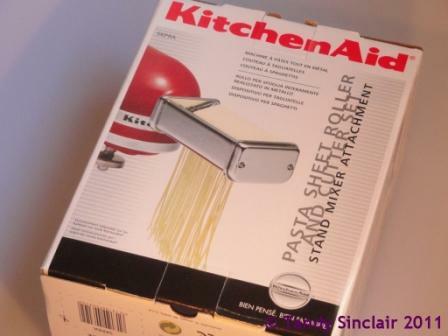 And I completely agree, the Kitchen Aid pasta attachment is the best. I use it to make homemade linguini, spaghetti, ravioli…all of them! How fun! I still have to do it the old fashioned way with a manual pasta machine and dry my pasta on a rod stuck between two dining room chairs! 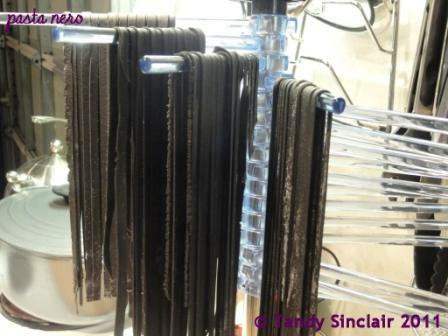 I love your pasta drying rack! You remind me to unpack my pasta machine! Can’t wait what sauce it will go with. I too love my KitchenAid pasta making attachment. As for the joy of kneading… I’m very happy that KitchenAid does it for me. This recipe inspires me to actually pull mine out of the cupboard. Yes it will, even if one could have done this for a magazine! Where do you get the chance to blog so much, as you have something every day! Thank you so much! I will check it out and get back to you shortly! Do you blog full time? I must admit that for me one of the main reasons for making any dough is the process of kneading it by hand. Also, I rather like turning the handle of my EGEA ‘Lusso 160’ (“macchine da pasta ad uso casalingo”) (I chucked out an electric pasta machine given to me many years ago in disgust after just one use – there was no magic in it for me. )… it really doesn’t take very long and it’s a soothing and satisfying process from start to finish. Hi Tandy, where can I buy 00 flour? Hi Christie-Anne, some Spar’s will keep it, as well as a good delicatessen. Where are you? In awe – love making fresh pasta but would never have thought of attempting this. Your pasta nero looks amazing. Because I know the size of your kitchen, I admire you all the more for making this!